Located in the heart of downtown Binghamton, the high school serves approximately 1,400 students each year in grades 9-12. 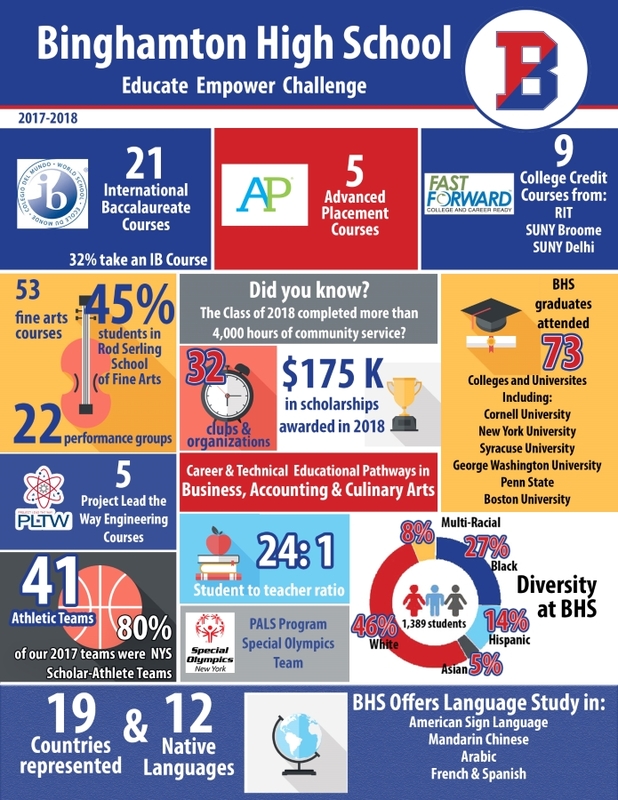 Binghamton High School is an International Baccalaureate Accredited School and offers 21 IB courses. The diverse academic curriculum at the high school includes 5 advanced placement courses, nine college credit courses, Project Lead the Way pre-engineering academy, 53 fine arts courses and career and technical pathways in business, accounting and culinary arts. BHS is home to the internationally recognized Rod Serling School of Fine Arts and features more than 22 performing groups. The school puts on a fall play, a spring musical and various concerts throughout the year. The school also features one of only a handful of steel drum bands in the state. We are proud to be a neighborhood school in a community with a strong commitment to education and collaboration. Just take a look at a number of items we have accomplished by clicking on the BHS Report Card above. Each and everyday BHS staff members work to build strong relationships with our students and parents. Our focus continues to be what is best for our students! If you have any questions, or thoughts to share, please do not ever hesitate to contact us directly. Our door is always open. Thank you for your continued support of Binghamton High School.